2013-14 OYO NHL Minifigures mark the first time the company has taken it's collectible toy line to the ice. With a roster of more than 100 players that covers every team in the league, they aren't rolling out lightly. Aimed at fans of specific teams, the minifigs resemble those you would expect to find with a LEGO set. They're actually fully compatible with LEGO and other similar building toys so your kids can build a house for Sidney Crosby or a spaceship for Alex Ovechkin if they want to. 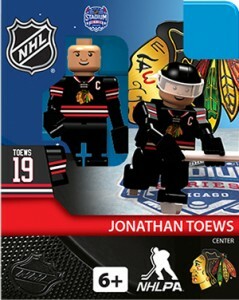 All 2013-14 OYO NHL Minifigures come with several accessories. These include a helmet with visor, stick, puck, skates and a stand. Each player is in their own jersey. And while the faces are somewhat generic, there are several variations to note things like the various states of hockey facial hair. To that end, there is some customization. Besides the main NHL line, OYO did a pair of small commemorative sets. A handful of players on Canada's Olympic roster have figures where they're in their national team jerseys. Select Chicago Blackhawks and Pittsburgh Penguins have special Stadium Series editions as well. These come with different jerseys (black for Chicago and white for Pittsburgh). The packaging also has the Stadium Series logo. 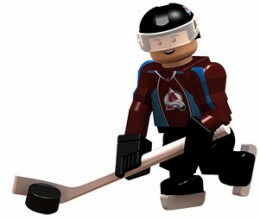 Click on the links below to browse on eBay for NHL OYO minifigures by team. 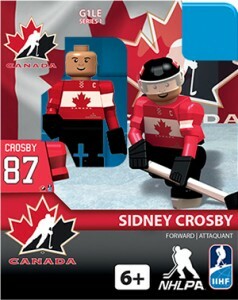 With the tabs above you can find the complete checklist of 2013-14 OYO NHL Minifigures as well as rosters for both the Team Canada and Stadium Series.